Roxi Zaroni in Love, Not War - 3rd Place Winner!! 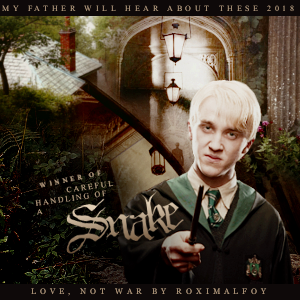 Draco Malfoy in Love, Not War - 1st Place WINNER!! My name is Saleena Blackwell and, whether I like it or not, I was born to be a leader. I have spent the last 30 years of my life running away from my past because I did not want it to become my future. But it seems that all is catching up with me now, as I find myself back in the last place on earth I ever wanted to be… my home. Absolutely perfect Banner made by Niika @ TDA. To others, this night might have been considered a disaster... But to us, it was perfect. ** This story is a companion piece for my Novel "Love, Not War". It took Second Place in KatieRoo's Firsts Challenge... So, if you read this story and then find yourself wanting to know more about Saleena and the Gypsies; please make sure to check out my Novel as well! Roxandrea Zarooni feels as if her whole entire world is on the verge of collapsing. But even still, she has a very important decision to make. When times of trouble strike, she has found that it is best to just live your life one day at a time, and see where life takes you. Percy Weasley was tired of being underestimated when all he wanted was to be treated like an equal. He had been longing for someone to acknowledge his true potential and take him seriously. Now that he had found just that, he was not about to let go. No more would he be mocked and mistreated by his peers, for Percy Weasley was about to commit the ultimate betrayal.